Hello! Today I’m going to share my Winter Wonderland Mason Jar Craft as part of Day Two of the Holiday Mason Jar Craft Extravaganza. 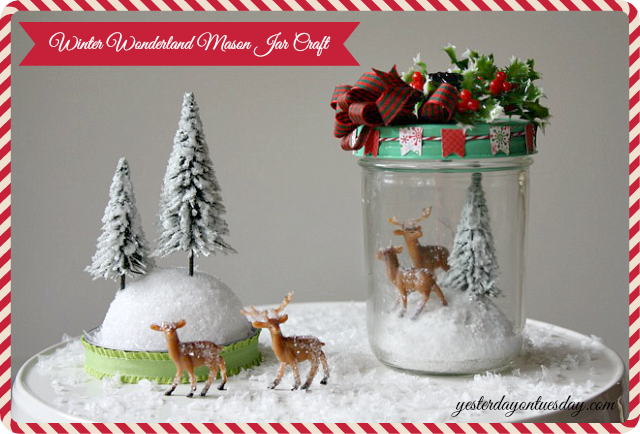 I love a peaceful, snowy scene… especially when it’s inside a Mason Jar! Here are the supplies I used. 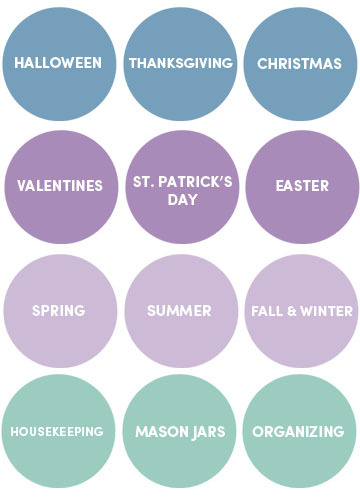 The item that I am most excited about is the jadeite green lid– which fits perfectly on wide mouth Mason Jars. It’s called a “Show Topper” and it’s made by Cosmo Cricket. (Left to right) Slice a styrofoam ball in half and paint with Mod Podge. Add Twinklets Diamond Dust. Cut the antlers off two of the plastic deer. Paint with Mod Podge and dust with Twinklets. Repeat with evergreen trees (I used four trees). Add the bow and holly to jar topper. I also used tacky glue to add tiny jingle bells. 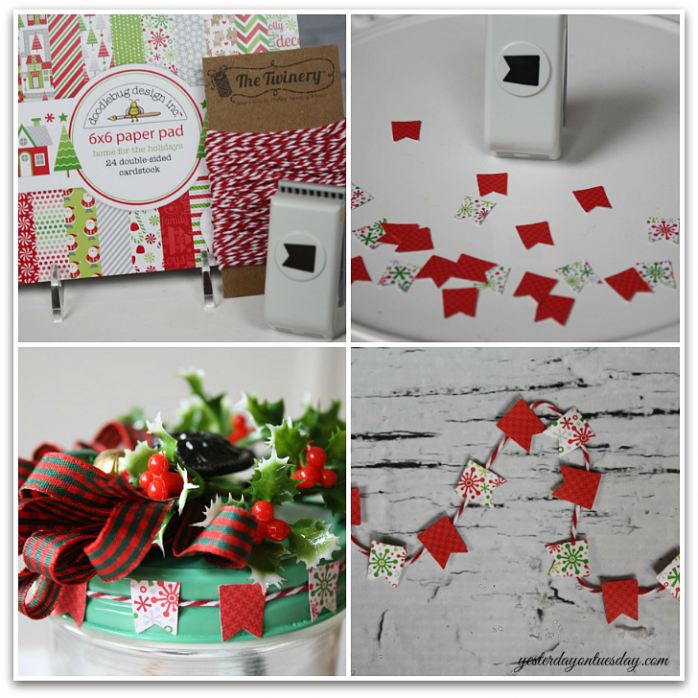 (Clockwise) To make the tiny paper banner, punch pennants out of holiday paper and use tacky glue to adhere to twine. 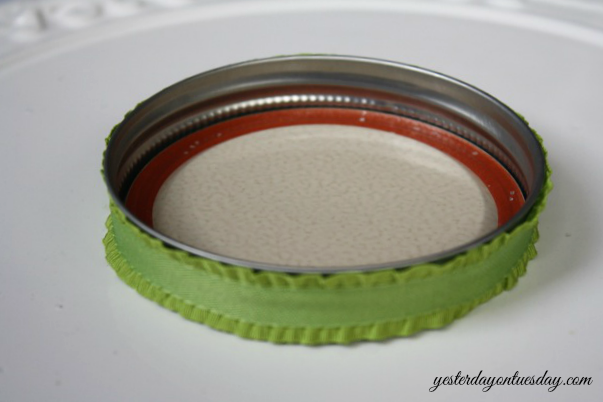 Glue on green jar lid. Take half of “snowy” styrofoam ball, and add evergreen trees and two deer. Set inside the Mason Jar. 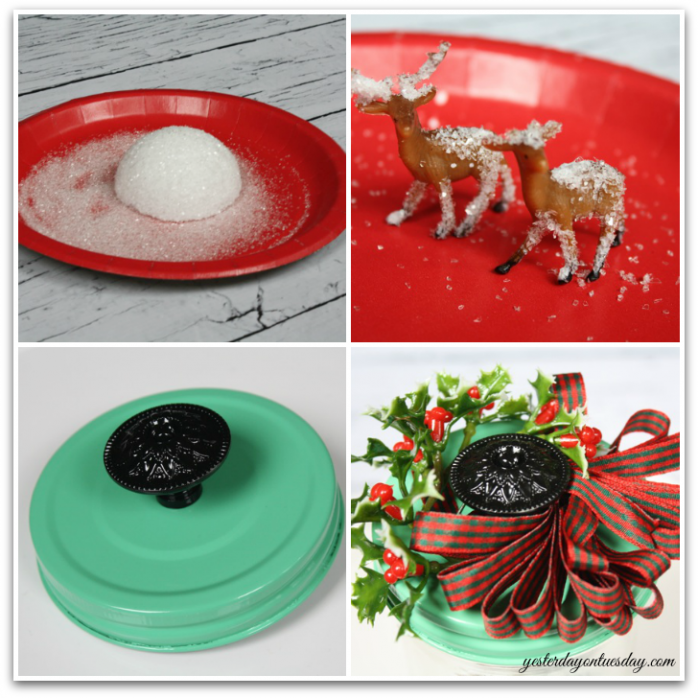 Take the original lid and use tacky glue to add ribbon to the rim. Place the other half of the snowy styrofoam ball and two trees inside lid. 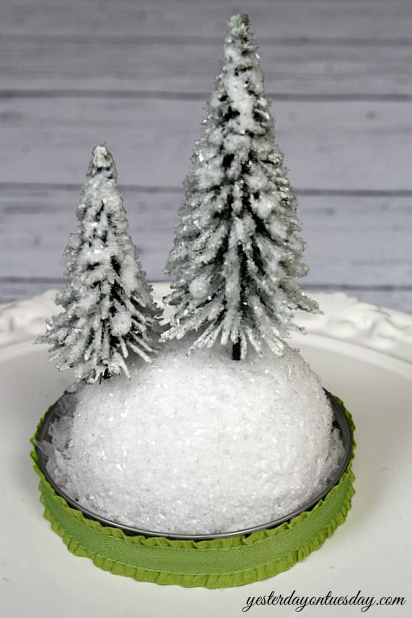 Create a winter wonderland on a cake plate and add faux snow. 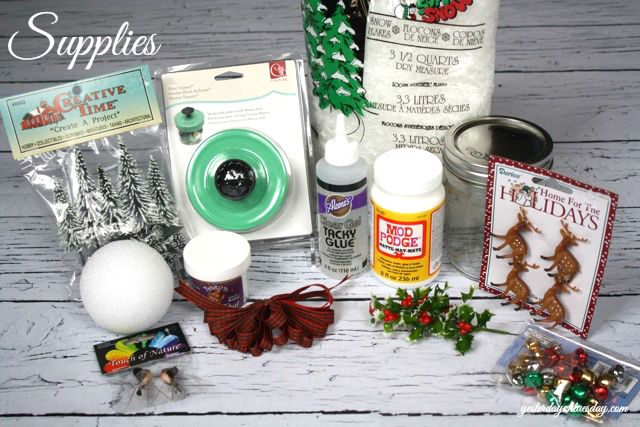 And this is just one of many crafts created for the Holiday Mason Jar Craft Extravaganza and Linky Party! 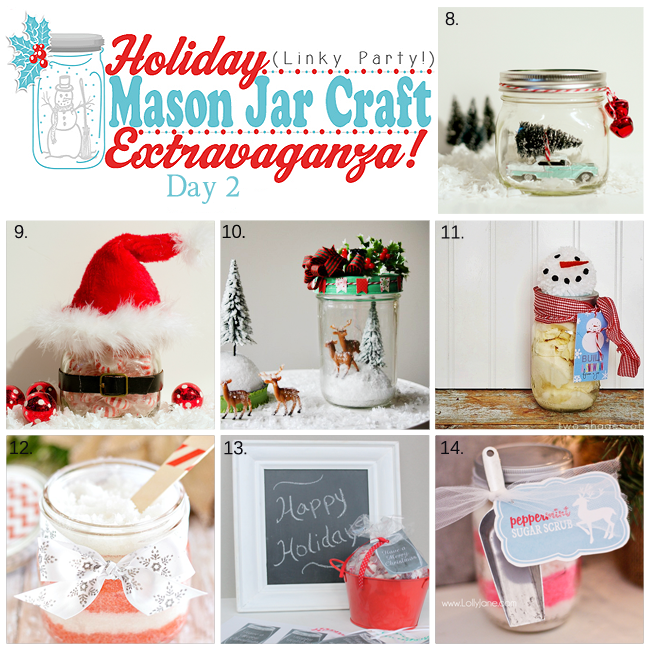 Join us tomorrow for the Holiday Mason Jar Craft Extravaganza Linky Party… where we can all share our Mason Jar projects and get inspired by each other! This scene is just so darling!!! My little car could be a perfect addition — though, maybe not for the deer! I just love your creation and amazing attention to the tiniest of details (that banner is darling!!). So happy to be a part of this mason jar party with you! LOL you are so funny! Loved being part of this amazing party… thank you! Oh my goodness! Every detail is just darling! That teeny bunting and that gorgeous lid! You always do everything so pretty! Malia, I love it all!!!! xoxo my sweet friend! 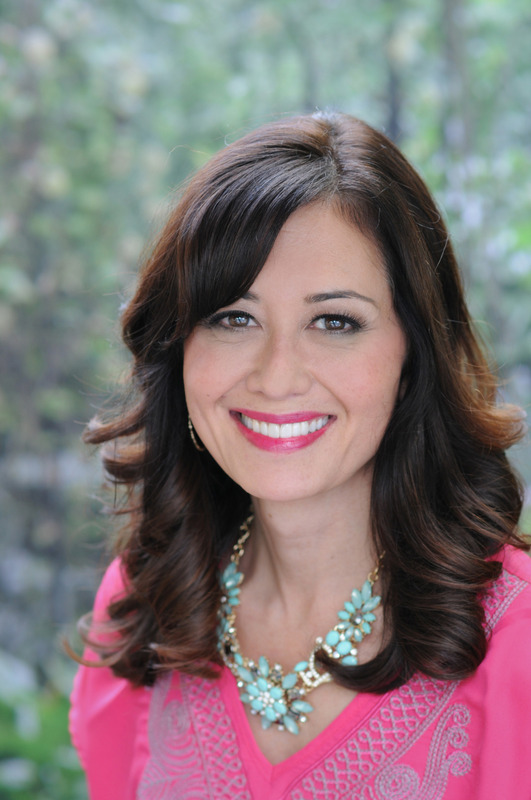 Thanks Jessica… I am still dreaming about your snowman project! xo Missed you too, so glad we reconnected!!! This is just so fun! I love the vintage feel, it reminds me of the decor from when I was a child! Thanks Michelle and I am so psyched about your dreidels!!! I’m glad you like them, my daughter and I had so much fun making them!! I can’t wait to make these jars with my kids, they are gorgeous!! Thanks ladies… I am all over your sugar scrub! SQUEEEEEEEEEEEEEEEEEEEEEEEEEEEEEEEEEEL!!!!!!! This is over the top adorable my friend!!!! I LOVE IT!!!! We even get a Winter Wonderland Scene!!!!! You out did yourself! I really adore this creation! A little Winter Wonderland piece of art!!!! Sending you tons of hugs and so happy to be a part of this extravaganza with you!!!!! oh my word Linda’s comment is hilarious ! Thanks so much for including me in this amazing extravaganza!!! 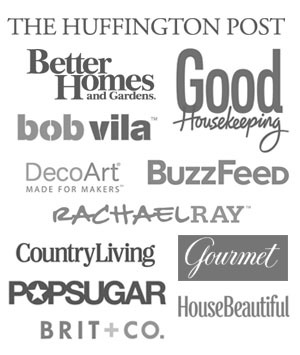 I love everyone’s projects especially yours and your fab printables!!! This is adorable, Malia! I have to know where you got that teeny tiny banner punch!! Pinned! LOK Keri it’s an EK Success punch. Actually it comes with two tiny banner punches! This is just so sweet! I love it Malia! Thanks again for including my project in your great round-up! You are so creative! I loved each detail that you added to both the inside of the mason jar and to the scenery you created around it. How cute is this!? I love that green lid too. And the little snow mound with trees – adorable! Thanks so much Alexis… I love these lids too. They are so cool! Malia ~ this is absolutely darling. I love the vintage look to the entire vignette. So happy to be partying with you! Thanks MB… loved your light up Mason Jar! Thanks Gretchen, I agree… the deer are so much fun and so easy too! I love Christmas, Mason jars and deer – Naturally I love this vignette you created. Thank you Donna! Wishing you a very Happy Holiday season! What a cute idea! Would make a cute gift or an east craft to do with older kids. I love this idea! It makes me want to start decorating for Christmas! 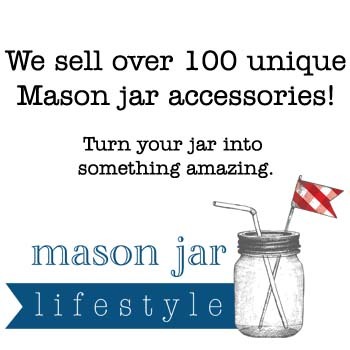 Thanks Tonia… it was fun being a part of the Mason Jar Extravaganza with you! I love snow scenes. My mom creates a ton of them around her house every Christmas. I would, too, if I didn’t have a cat to contend with. LOL… my dog always gets in my way when I am trying to take pix for the blog… it’s so funny! YOU ARE A GENIUS!!!!!!!!!!!!!!!!!!!!!!!!!!!!!! I’m off to Michaels now! Thanks Sharon… that was the nicest comment ever! Made my day. 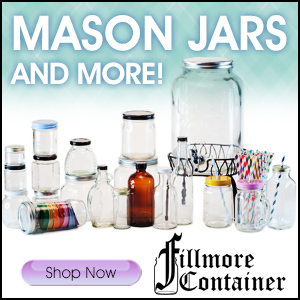 Hope you are having fun with your Mason Jar project. I’d love to see it! This is so cute Malia!! I love the little “hill” you made out of the foam – that was so smart! Where did you find the little deer? I looked at Michaels and Hobby Lobby with no results. Searching on line now. 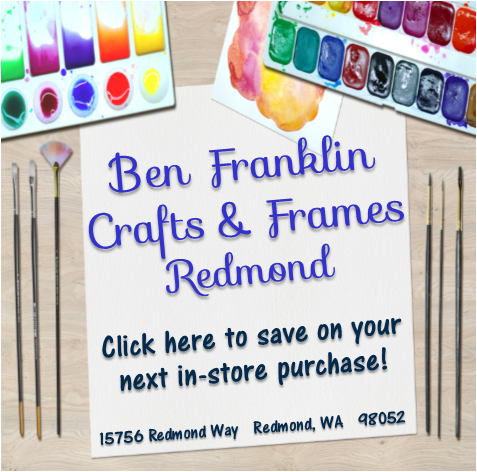 Hi Ger, the little deer are made by Darice and I found them at Ben Franklin Crafts in Redmond, WA (love that store). Here is a link to the deer on the Darice website: http://www.darice.com/store/details/catalog/wholesale-basics-miniature-accessories/1625-009. I cut the antlers off 2 of them to make them “ladies” J. Hope this helps! I’d love to see a photo of your finished product! Love this…I am inspired. Every year I say I am making this and never do…but this is the year! Where did you find the reindeer? They are adorable! Absolutely one of THE cutest jars I’ve seen. The mini pennant banner is amazing! One of the absolute cutest jars I’ve ever seen! My favorite part is the mini pennant banner!